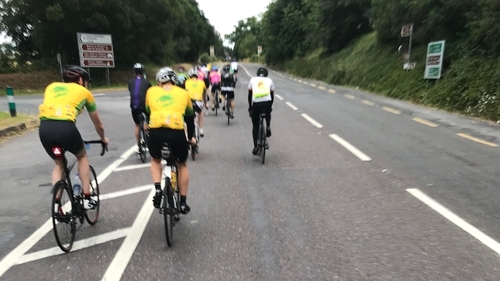 Around 7,000 cyclists are taking part in the 35th annual Ring of Kerry Charity Cycle, which organisers say is the biggest one-day fundraising cycle in the country. The event has raised more than €13 million for a host of charities since its inception. This year the number of charities who will benefit from the cycle has been expanded to 15, to include Pieta House, the Irish Kidney Association and Enable Ireland. Local charities will also benefit, including the Kerry Hospice Foundation, Bru Columbanus, the Buy a Bus campaign for the Kerry Parents and Friends Association and St Mary of the Angels in Beaufort, Co Kerry. The 175km route takes cyclists through Killorglin, Cahersiveen, Waterville, Catherdaniel, Sneem, Kenmare and Moll's Gap, before returning to Killarney. Former taoiseach Enda Kenny is taking part. Also taking part is the former Munster and Ireland rugby legend, Mick Galwey.